When I first heard about the Thermomix, an all-in-one kitchen appliance from Australia, it sounded like an old SNL commercial parody: It slices! It dices! It heats! It kneads! Is there ANYTHING this machine CAN'T do? Um, yes. At almost AU$2,000, it can't pay for itself. In the U.S., you'd probably end up paying more if you can find one. However, the more you read about the Thermomix, the more impressive it sounds. I can see saving up for it, especially if you have a space-challenged kitchen or just hate clutter. 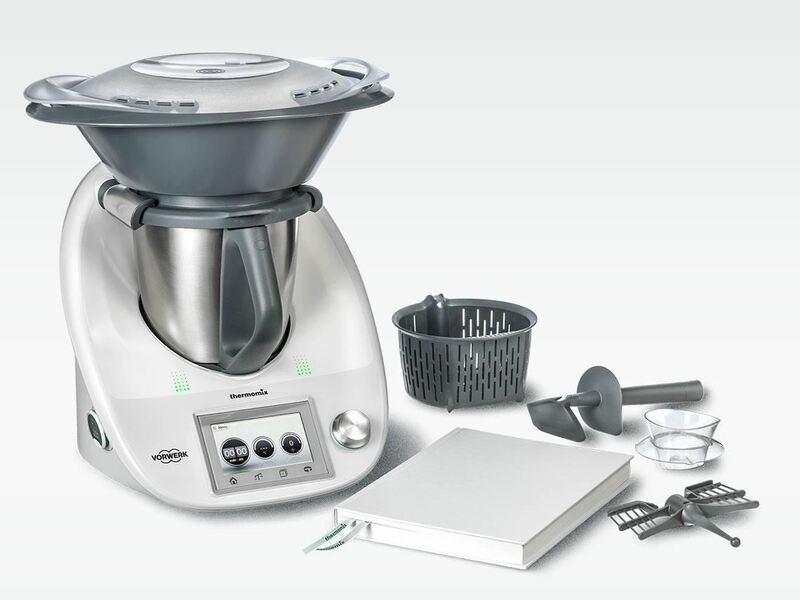 For those of us who aspire to sleek minimalism, the Thermomix is a dream come true. 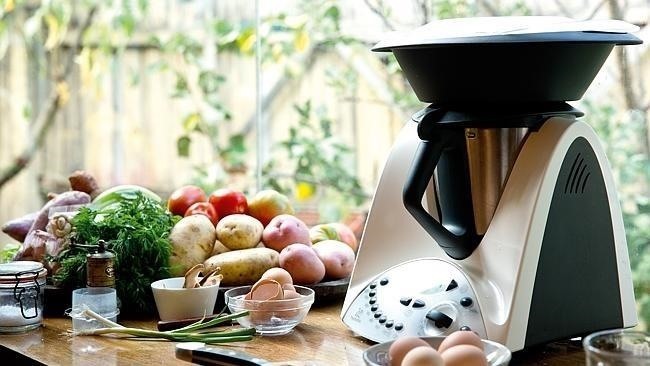 What Can the Thermomix Do? 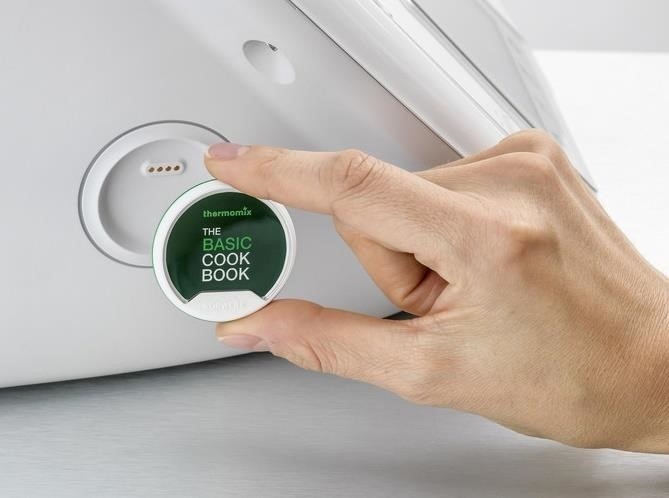 According to Vorwerk, the company that makes it, the Thermomix "combines twelve appliances in one with functions that include weighing, mixing, chopping, milling, kneading, blending, steaming, cooking, beating, precise heating, stirring and emulsifying." In other words, it's a food processor/blender, microwave, stove, steamer, bread machine, and digital scale all in one. Essentially, you can prep all your ingredients in the mixing bowl and cook it in there, too. Another plus? You can make things like pasta sauce, risotto, and soups in the Thermomix without stirring. I mean, that's pretty great. And according to online reviews, the Thermomix is pretty easy to learn to use and combines/eliminates a lot of prep work so it makes cooking quicker and less wasteful. There's also a feature that lets you attach recipe chips to the side that show you the full ingredients list for dishes on the display, and which program the necessary cooking settings for you. It comes with a chip for The Basic Cookbook, which is also included. Well, that's hard to say. Many fans of the Thermomix say that it's a godsend for people who want/need to cook from scratch for almost every meal (i.e., the very healthy/frugal or those with food allergies). But because the price tag is so high, it's something you want to be very, very sure of before you start saving for it. I will say that what I've seen of the Thermomix at cooking demonstrations and food shows is impressive. It's clearly a well-made and designed machine outfitted with a quality motor, which other reviewers have noted as well. This sucker is built to last. And I do I love the idea of having one compact, well-built appliance able to take care of all of my food prep needs. However, there's a vocal contingent that isn't crazy about the machine. Sure, it's convenient, but they say the food made with the Thermomix can be bland and lack the depth of flavor you get when you cook on the stove. Plus, there's only a two-year warranty. The biggest issue that I see is that its seal needs to be replaced every two years (obviously, the warranty won't cover it), and that seal costs around AU$15, but if you can afford the insane asking price to begin with, a few extra bucks every other year isn't going to kill you. Unless you don't actually buy replacement seals, which could be seriously detrimental to your health (not to scare you or anything). Did I mention that there's pretty much a cult of rabid Thermomix users? I mean, maybe they don't have an official uniform or anything, but people who love the Thermomix really love their Thermomixes. And, by the way, some say it's a pyramid scheme, so you've been forewarned. Just for shits and giggles, I thought I'd throw in this clip from "The Katering Show." Their review of the Thermomix is pretty damn amusing. Enjoy!